Each of these panoramic views is a controlled mosaic of approximately 300 IMP images covering 360 degrees of azimuth and elevations from approximately 4 degrees above the horizon to 45 degrees below it. Simultaneous adjustment of orientations of all images has been performed to minimize discontinuities between images. Mosaics have been highpass-filtered and contrast-enhanced to improve discrimination of details without distorting relative colors overall. TOP IMAGE: Enhanced true-color image created from the "Gallery Pan" sequence, acquired on sols 8-10 so that local solar time increases nearly continuously from about 10:00 at the right edge to about 12:00 at the left. Mosaics of images obtained by the right camera through 670 nm, 530 nm, and 440 nm filters were used as red, green and blue channels. Grid ticks indicate azimuth clockwise from north in 30 degree increments and elevation in 15 degree increments. 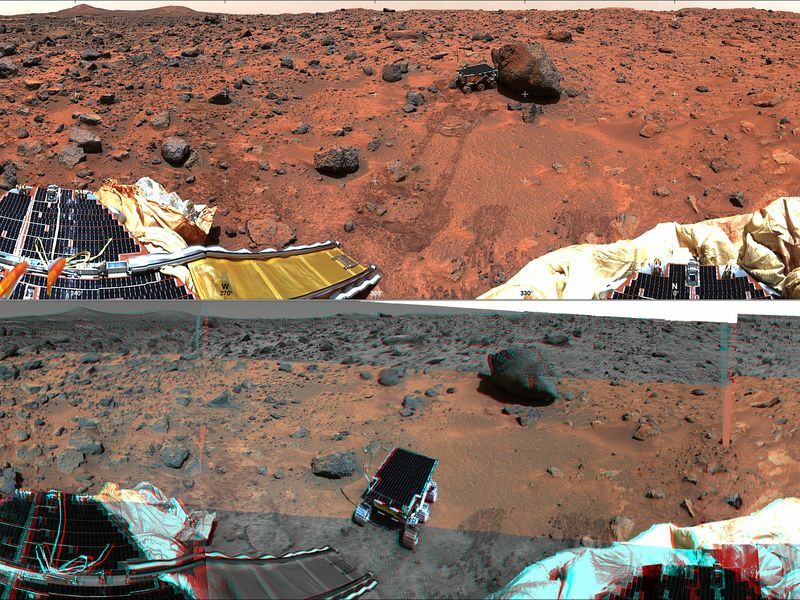 BOTTOM IMAGE: Anaglyphic stereoimage created from the "monster pan" sequence, acquired in four sections between about 8:30 and 15:00 local solar time on sol 3. Mosaics of images obtained through the 670 nm filter (left camera) and 530 and 440 nm filters (right camera) were used where available. 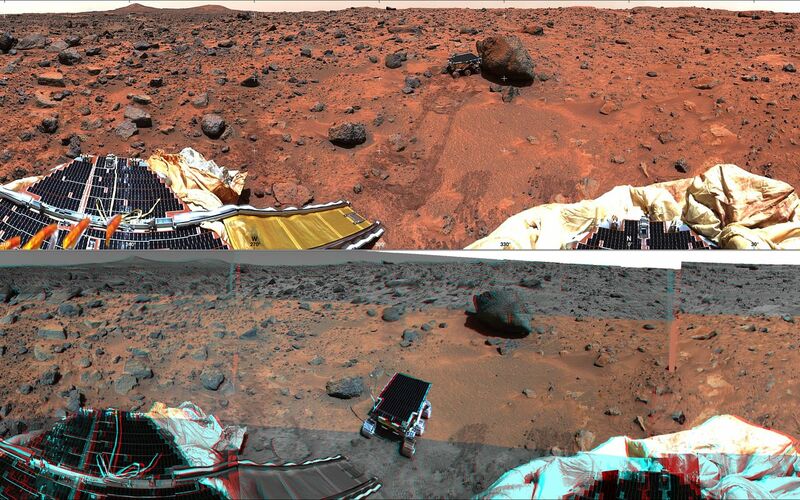 At the top and bottom, left- and right-camera 670 nm images were used. 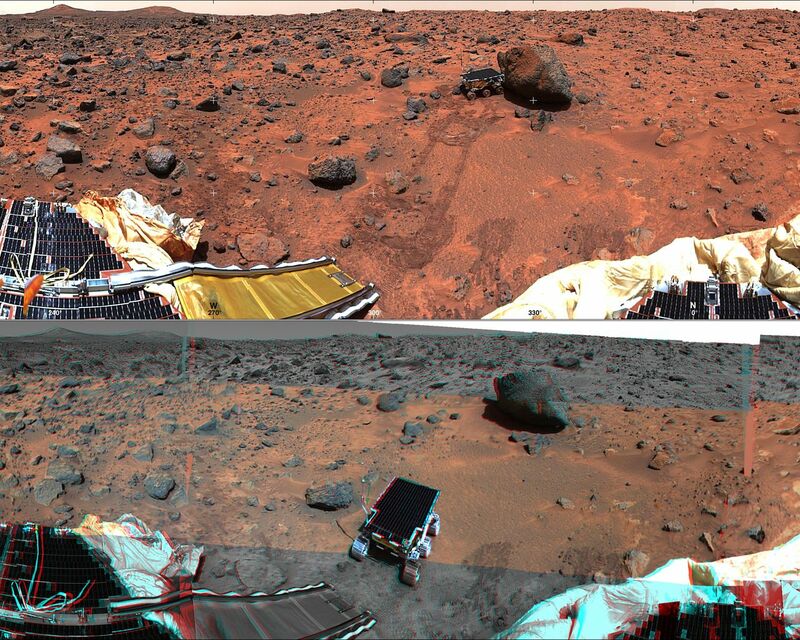 Part of the northern horizon was not imaged because of the tilt of the lander. This image may be viewed stereoscopically through glasses with a red filter for the left eye and a cyan filter for the right eye.